In addition to our new 400,000 square feet distribution center in Mexico, we are in the process of expanding our global facilities with an additional 350,000 square feet. This expansion addresses a number of strategic initiatives. Number one, it enables us to support existing as well as new business commitments commencing in the upcoming fiscal year and expand our capacity to support future sales growth. Number two, the customers' buying experience will be enhanced by consolidating shipments from multiple product lines from a single point of origin. Number three, it will facilitate a more effective cost structure, resulting in enhanced gross margins. I should also mention the growth opportunities that will be realized through our recent acquisition of the heavy-duty company Dixie Electric. It has a solid customer base, innovative products, enhanced heavy-duty expertise and a dedicated team of professionals. The acquisition also provides additional light-duty rotating electrical sales expansion opportunities as well as growth from our current brake offerings, diagnostic testers and future product lines. In addition, we gained capacity and manufacturing capabilities in India, which could over time supplement our current Chinese sources, while also providing a strong hedge against inflation in China and recently announced trade tariffs. To highlight our positive overall outlook, I refer you to our investor presentation on our website, which shows some macro industry charts, including a chart related to the expansion of the car park, sweet spot for repairs. We are now seeing the back end of lower new car sales from recession years and the prime parts replacement time frame. Essentially, the number of prime replacement age vehicles is growing. These statistics further support our Company's and our industry's optimism for growth over the next several years. I will now turn the call over to David to review the results for the fiscal third quarter. Thank you, Selwyn. To begin, I encourage everyone to read the 8-K filed this morning with respect to our December 31, 2018 earnings press release for more detailed explanations of the results, including reconciliation of GAAP to non-GAAP financial measures and the 10-Q, which we filed later today. Let me take a moment to review the financial highlights for the fiscal 2019 third quarter, reflecting record sales for both the quarter and nine months on a reported and adjusted basis. The results for the quarter and gross margin were impacted by five items totaling $9.7 million as follows. Customer allowances and stock adjustment costs of $2.7 million related to new business and product line expansion, including upfront costs and core buyback premium amortization expense. Core sales of $7,753,000, less related cost of goods sold of $7,750,000 which had no effect on cash or net income for the quarter, but did negatively affect our gross margin percentage for the quarter and a fixed cost of $767,000 all in connection with the cancellation of a customer contract. A non-cash write down of $2.6 million associated with the quarterly revaluation for cores on customer shelves. This does not affect the reimbursable amount for the full value of cores on the customer shelves should business with the customer be discontinued. Net tariff costs of $1.5 million paid for products sold before price increases were effective. And transition cost of $2.1 million associated with the expansion of manufacturing and distribution capacity to support increased demand for our products, including new brake product lines. Net sales for the fiscal 2019 third quarter increased 20.6% to $124.1 million from $102.9 million for the same period a year earlier. Adjusted net sales for the fiscal 2019 third quarter increased 14.4% to $119.6 million for $104.5 million a year earlier. The adjusted net sales increase of approximately $15.1 million consists of the following: rotating electrical net sales increased $14.5 million to $95.2 million for the third quarter from $80.7 million for the prior year. Wheel hub assemblies and bearings net sales decreased $839,000 to $18.3 million for the third quarter from $19.1 million a year earlier due in part to lower demand. As an aside, we expect the recent extreme cold weather conditions to positively impact wheel hub sales. Brake master cylinder net sales decreased $246,000 to $1.6 million from $1.8 million for the prior year, substantially due to unusual inventory adjustments by the customers. We anticipate increased momentum as we launch our full brake line program. Additionally, the combined net sales for third quarter for brake power boosters, turbochargers and testers increased $1.7 million to $4.6 million from $2.9 million in the prior year. We expect exciting growth in each of these product lines. Gross profit for the third quarter was $21.2 million compared with $26.1 million by year-over-year. Gross profit as a percentage of net sales for the third quarter was 17% compared with 25.3% a year earlier, which was impacted by the five items previously highlighted. Adjusted gross profit for the third quarter was $30.9 million compared with $30.7 million a year earlier. Adjusted gross profit as a percentage of adjusted net sales for the third quarter was 25.8% compared with 29.4% for the prior year third quarter. Adjusted gross margin for the quarter was impacted by several factors, including higher freight and wage costs, higher returns, the introduction of electric vehicle test systems, over time and other costs related to the increase in new business, and other strategic initiatives for long-term growth. Total operating expenses increased by $1.9 million to $19.5 million for the third quarter from $17.6 million for the prior year. Adjusted operating expenses increased by $1.5 million to $16.2 million for the third quarter from $14.7 million for the prior year. The increase in adjusted operating expenses was primarily due to personnel and related expenses to support our value-added customer service programs and growth including sales in both our hard parts and diagnostics businesses, merchandising, marketing and engineering, commissions due to increased sales, Mexico-related expansion expenses and overall expense increases related to growth. As mentioned previously, due primarily to the several items impacting gross margin, operating income was $1.6 million for the fiscal 2019 third quarter compared with $8.4 million for the prior year third quarter. Adjusted operating income was $14.7 million for the third quarter compared with $16 million for the prior year. Adjusted EBITDA was $16.2 million for the third quarter compared with $17.2 million for the period a year ago. Depreciation and amortization expense was $1.7 million for the third quarter. Interest expense was $5.8 million for the third quarter compared with $4 million last year. The increase in interest expense was due primarily to an increase in the utilization of our accounts receivable discount program, increased average outstanding borrowings as we build our inventory levels to support higher sales and higher interest rates on our average outstanding borrowings under our credit facility and our accounts receivable discount programs. Income tax benefit for the third quarter was $1 million compared with income tax expense of $7 million for the prior year period. The new tax law resulted in lowering our total blended corporate tax rate from 39% to 25% effective January 1, 2018. The income tax expense for the prior year third quarter of $7 million includes a $4.8 million tax charge, of which $4.3 million as a one-time non-cash book tax charge for the revaluation of deferred tax assets and liabilities related to the December 2017 enacted Tax Reform Act and a one-time tax charge of $545,000 due to the transition tax on deemed repatriation of accumulated foreign income. Net loss for the third quarter was $3.1 million or $0.16 per share, compared with net loss of $2.5 million or $0.13 per share a year ago. Adjusted net income was $6.7 million or $0.35 per diluted share for the third quarter compared with $7.9 million or $0.41 per diluted share for the prior year. Let me now discuss the results for the nine months ended December 31, 2018. Net sales increased 11.7% to $343.7 million from $307.8 million for the prior year nine months. Adjusted net sales for the nine months increased 9.5% to $343.6 million from $313.7 million for last year. Net loss for the nine month period was $5.1 million or $0.27 per share compared with net income of $10.9 million or $0.56 a year ago. Adjusted net income for the nine months was $21.2 million compared with $26.5 million for the prior year nine months. And adjusted diluted earnings per share were $1.10 compared with $1.37 last year. Adjusted EBITDA was $49 million for the nine month period, compared with $55 million a year earlier. As of December 31, 2018 trailing 12 months adjusted EBITDA was $71.7 million and the average equity and net debt balance was $349 million, resulting in a 20.6% return on invested capital on a pre-tax basis. Our method of calculating ROIC is to divide trailing 12 months adjusted EBITDA by the average equity and net debt balance for the 12-month period. At December 31, 2018, we had net debt of approximately $98.6 million, total cash availability on the revolver credit facility was approximately $129 million at December 31, 2018 based on a total $200 million revolver credit facility and subject to certain limitations. At December 31, 2018, the Company had approximately $606 million in total assets. Current assets were $330 million and current liabilities were $251 million. Under the authorized share repurchase program, as of December 31, 2018, $15.7 million of the $37 million common stock authorization has been utilized and $21.3 million is available to repurchase shares. Net cash used in operating activities during three months ended December 31, 2018, was $13.9 million, primarily due to a $6.9 million increase in inventory, net of accounts payable for new business and growth and $6.3 million refundable payments for core purchases relating to new business. When further analyzing the $13.9 million cash used in operating activities, please note that we had three significant categories of cash expenditures for the quarter totaling $19.7 million comprised of; first, $11.8 million spent on items that will lead to growing our business, which includes expenditures for (inaudible), transition costs relating to moving to larger facilities, customer allowances and returns for new business, new product development costs and expenses related to our two new acquisitions. Second, $6.3 million spend for core buyback payments related to new business and third, $1.5 million spent for net tariff costs before price increases. For the reconciliation of non-GAAP financial measures, please refer to exhibits one through seven in this morning's earnings press release. Effective April 1, 2018, the Company adopted Accounting Standards Codification Topic 606, Revenue from Contracts with Customers using the full retrospective transition method. The Company believes the effect on our income statement is not material, the effect on the balance sheet is to reclassify certain accounts. Additional information is available in the Company's Form 10-Q filing later today. Thanks, David. As you can see we have a clear path ahead for growth with multiple opportunities. First, we have a significant array of non-discretionary hard part product lines, including rotating electrical, which is alternators and starters; brake-related products, which we define as wheel hubs and bearings, brake rotors, pads, master cylinders and boosters; and we have turbochargers. With the new Dixie acquisition, we've extended our rotating electrical offering and channel to the heavy-duty market and we now have additional opportunities to sell our full broad range of products in the heavy-duty channel. In addition, we will not be able to offer our heavy-duty products to our current customers. We have a strong offering of diagnostic products to complement these non-discretionary hard parts, beginning with our rotating electrical testers and following up with the possibility of launching diagnostics for all of our hard parts. Second, we have a strong offering for our diagnostic products for electric vehicles. We are aggressively pursuing integrating the technology and management of our new E&M Power acquisition into D&V, which will have a global footprint and an exceptional management team enhanced by E&M. The combined offerings will make the D&V product more important in the electric vehicle space and complements the demand and growth for electric vehicle diagnostic testers for both pre and post-production applications. In summary, as you heard, we have many growth opportunities and the new business commitments are continuing. Our position in our base product lines and new product lines is robust and we anticipate accelerated double-digit sales growth and margin enhancement as we progress through our inflection for fiscal 2020 and forward. The Company in a whole -- as a whole is very well positioned to create value and we look forward to updating you on the significant opportunities as they evolve. Thank you. (Operator Instructions) Our first question comes from Chris Van Horn of B. Riley. Your line is open. Hi, good morning. Thank you for taking the call. Just to follow up on your comments just at the end there Selwyn, just make sure I heard you correctly. Did you say a goal of double-digit topline growth for fiscal year 2020? Yes, I mean, I said accelerated double digit. So I think, we feel we can sustain the growth rates we have now for the next couple of years. Okay, got it. And would you be able to -- I know, you said margin expansion from current levels, would you got to give any more detail there -- around maybe some ranges of what we might expect in 2020? Yeah, I think you know the big -- the big thing to understand today is we have so much growth on our hands and there's so much happening in terms of embellishing all of our capacity around the world, that certain parts of our operation not as efficient as they could be, because they've been delayed from moving into the new footprint just based on demand for new products. So I think, at a minimum, the fundamentals of our margins will return and quite honestly as we get into the new footprint. I mean we should have incremental savings. But I think restoring our margins back to the high end of our range of guidance, we believe is very realistic. Now the one thing, I will -- I just want to point out is that a lot of different product lines are going to be growing in different rates. So as these product lines grow, there could be differentiation in the margin, just because of product mix, but the fundamentals of the gross margin, key elements by product line we believe are very much -- are very sound and will improve as time goes on, as we get through the transition into our new space. Got it. And then, kind of on that front, I know you had -- you talked about some cost efficiency opportunities out of the Mexican distribution plan. And I'm wondering where you are on that front? And then this 350,000 additional, I think, you mentioned there is some opportunity for cost savings as you open that new footprint. What's your timing on that as well? Yeah, so the new 400,000 square foot distribution center is up in running and it's fully handling all of rotating electrical. It's also ramping up from the new brake product lines. It's also handling some of our undercar items, but not fully yet. In conjunction with that -- we have -- this is in Mexico, we have two new buildings going up there. I would say that those buildings should be complete, one is further ahead than the other, but by the end of this calendar year and we should see new revenue from new product lines start shipping in the July time frame and our commitments are significant. So again, that will give further guidance in the next quarter hopefully but our commitments are so significant. Got it. And then last one for me. Just on a macro perspective, you've seen some of your customers report really good comp sales growth and they're identifying whether as a good trend, obviously this winter especially for us here on the East Coast. Just wondering what were you're hearing on that front in terms of customer order trends and I imagine there's probably the destocking is well behind us now and just some update there? I think, again I'm listening to the same information that you are and I think, overall our industry is optimistic on where we are, the car park is aging and is moving back into sort of in a prime metric opportunities, so weather with the polar vortex certainly is going to help. We hope we have some continued extreme weather I'm sorry, for you guys on the East Coasts and the Midwest. But certainly, we hope that continues for little bit longer. But the outlook is very positive from the fundamentals, I will point out that December what are -- what you've heard publicly sort of December, January, were a little bit softer. But that happens every now and again but it's back. So from the fundamentals of our industry, I believe, if you look at the statistics and you see what our customers are doing that the fundamentals are very sound and the next three years are going to show some nice growth and just fundamental replacement. Can you maybe talk about -- last quarter you had updated your guidance for the full year, but you had said that you expected to be at the high end of your sales range of $465 million to $475 million and I guess, the gross margin is at the lower end of 27% to 31%. Can you maybe just with little less than a quarter to go here, what you're thinking for the full year, and this will give us a better idea of what kind of a base we can look forward toward 2020 where the margins similarly are going to improve? Yes. So I mean, we don't want to give quarterly guidance Scott, but we are not provoking our annual guidance and so you can see we've got some strong revenues. So our guidance remains, but you can -- you can see the strength in the revenue base. So now fundamentals are positive and we are making great progress and I think next year we're going to see better margins. Probably the guidance will be, we are hoping that for next year, next fiscal year, we'll -- we will give you some more guidance in the next -- the next quarter in the year end report. Okay. So what you said last quarter, I guess, it still stands as of now for the rest of the year -- or for the full year? Correct. Correct, but -- again just looking at it, the revenues are little stronger than we thought. And then, so, which is good. And so, we'll see. Okay. And as far as price increases, I know some of these items that you talked about, will be a little bit stickier and tougher to go away, whether it's labor and just given the work environment here and the shortage of workers and some other items. Maybe just talk about your ability or what you're seeing on the price increase side? What you've been able to do so far to counteract that? And if not, what will be the ways of fighting that next year, whether it's just giving some streamlining and cost cutting and things like that? Yeah, well again, firstly, the tariff pricing is now fully in effect, so we were able to compensate for the increased tariffs out of China and obviously, we continue to monitor it very carefully where that is. I think, you know, the headwinds and cost are clearly in labor rates around the world and freight rates, I mean, we hope that freight will reverse itself. I mean we believe that with our new moves -- our new footprint, freight will become more efficient, because of our consolidated shipping point. So, the ability to eliminate as much LTL, less-than-full-truckloads is going to be enhanced dramatically by having multiple product lines come out of one distribution point. Productivity is always a focus of us. We believe we have some of the most productive plants in the world. We have a fabulous, continuous improvement team and we continue to work to make our facilities more efficient. But at the end of the day, if pricing -- if cost inflation is going faster than we can get productivity, I mean at some point, some one's got to pay for that. And so that's going to -- will come through price increases. We intend to be very rational in our pricing. We intend to make sure that we don't have waste in our system. So, we are not charging the customer for waste. But if they are true costs and they are going up, we truly believe that needs to be passed through and ultimately paid for by the entire process, which is ultimately the consumer. All right. That's great. And just a last question here before I jump back in the queue. One of the adjustments to sales were $6.9 million, $7 million, I guess connection with the canceled contract. Was this business that was lost and I guess, money coming back to you to compensate for that, or was that something else? We lost -- we did lose a customer, and this is basically a reversal of the deferred asset and liability accounts that relate to their customers' non-cash. In this quarter, at some point it was cash way back when, but it's non-cash and the loss of those customer is not affecting any of our guidance at this point. Yeah. And this is -- do you expect further -- or this covers everything related to that customer? Yes, I mean, we've still got to -- picking up the last bit of the receivables from that, but we expect that this is the end of that. Got it. All right. That's all I have. Thank you. Thank you. Our next question comes from Matt Koranda of Roth Capital Partners. Your line is open. Hey, guys, good morning. Just maybe to drill down a bit more on the fiscal year '19 outlook. I guess revenue, it looks like it's well ahead of the range you guys provided. But to get back to sort of the low end of your gross margin guidance, I guess it looks like when I run through my model would require at least 30% gross margins in Q4, but with the wage and freight pressure that you're citing I guess, what are the puts and takes that sort of allow you to get back to that level in a relatively quick time period? Yeah, again the fundamentals are in place I think, Matt what we're suffering from is a lot of -- a lot of growth costs. Not everything can be captured and adjusted. We are -- we're cognizant of the size of the adjustments, which we don't like. But trying to show what the underlying factors are. I mean, I believe, we can hit the low end of our guidance of around 29% gross margins for the fourth quarter. So we do expect a recovery in our margins soon and as time goes on, it will get better. I mean there is some -- I would say be conservative on the margins at this point, because we are in a heavy growth mode and there are variables relating to that. But we again, I've said a lot of times, it doesn't seem to not clear in the numbers because of the noise in the numbers, but the fundamentals of our margins, once this transition completes are very much intact and the footprint is sufficient. And I think -- the environment we're in today in the market and I hope that this is an accurate statement is rational in terms of pricing. So, there's escalating costs coming from all directions and we've done a great job in my opinion of managing that again, other than the noise factor in the numbers. And so we don't believe that we are any worse off from a cost structure than anybody else in the industry and not everybody is going to be making the appropriate moves for some cost inflation. Okay. And just to clarify on the pricing commentary you made earlier. Have you guys actually put through price increases to address passing through the tariffs, is that what you were saying and you haven't put there any further price increases. I just wanted to pin that down? Okay, got it. Maybe you could talk about on a go-forward basis. I mean, there's obviously been some competitive changes in your environment and it does seem like your customers, at least in the DIY retailer and DIFM retailer channel or at least somewhat amenable to passing through sort of like-for-likes SKU inflation to their customers. So could you talk a little bit about what's happened with the pricing environment if that's changed at all in the last couple of months in terms of that -- that discussion? Yeah, I don't know if it's changed in the last couple of months because I mean, maybe it's evolved. But if you think about the customer base, I mean they need sound supply, they need viable suppliers, they need reliable suppliers, fill-rates are critical to these customers, if they don't have the inventory, they certainly are not going to be able to sustain their revenue and growth numbers. And so at the end of the day, while the customers are extremely tough and challenging in terms of monitoring their costs. I think, when they understand the realities of inflation and I think, the competitive base, if everybody is saying the same thing and they start doing their homework, I think, just gravity takes effect. I mean, we're in a phase of inflationary costs and inflationary global wage rates, I mean forget about tariffs even. Wage rates through all of Southeast Asia, Northern Asia, and the African states, we do global surveys all the time, I mean, there is an inflationary -- we are in an inflationary wage rate environment. And so I think our competitors are rational and I think our customers are ultimately as much as they don't want that are rational. And I think, at the end of the day, if they have solid suppliers and they are able to get appropriate inflation in their pricing, the consumer needs to pay a fair price for the products they are receiving. They are getting a very fair price today and they'll continue to get a fair price. I mean, no one is going to be paying for waste. But if there is fundamental inflation, someone has to pay for that. I mean we all live with that unfortunately or fortunately, I don't know. So I think at the end of the day, while it's not an easy challenge, I do think that if we continue on this trend, there has to be those conversations. Got it, that's helpful. Maybe on the wage inflation front, Selwyn. Is there a way to quantify the headwind that you're facing in hourly wages in your Mexico facility. And any help there would be appreciated. And then also just in terms of the percentage of your cost of goods it's represented by direct labor some dimensioning there would be helpful as well? I think, you've seen the worst of it and it's over now in terms of -- we had a base, the Mexican -- new Mexican government had implemented that base increase in the minimum wage. I mean, we've absorbed that, we've adjusted our wage rates across the board. So it's to me, while it's not been -- and at this point is not material going forward. I would tell you that freight is a bigger, is probably a much bigger drag right now. I believe that and I think in the American way, there is a shortage of capacity that freight industry is not going to sit back and let a shortage of capacity continue and people going to want to get more share and there is going to be more capacity that's going to come on board. And so I think, that one corrects itself at the end of the day because we are in a very competitive freight environment. So, I don't know when that happens. Also the own -- can't predict fuel prices that you know everything I read is that, they should be at least stable not -- not too inflation at this point, if not coming down. So I think freight should reverse itself that, and then I can tell you just the mix of how we produce and where we produce. We can save a lot of money when we get through this transition and we're going to go an whole new inflection point in terms of revenues. So, it's a little bit of a noisy time for us, but it's going to change. Okay, that's helpful. Just last one to follow up on the cancellation of the customer contract. I guess, I was under the impression that there would be a cash inflow with certain cancellations, if you're getting, if you're essentially getting rid of cores, long-term core inventory, that's on your balance sheet. So is there a future cash implication of this or why wouldn't there be a cash inflow associated with the cancellation? Yeah, so in the case where you -- there are two types of programs we have with customers, we have full core programs and we have pending core programs. Those particular customers on a full core program, which means when they get a core, they pay for it and when they return, they will get a credit. So all of this is reversal of accruals really on the balance sheet and that's all this is. So, there is no cash implication of all in this one. The cash happened when the transactions happened. These are a reversal of accruals for future business and future returns and so that all just goes away. So really that -- you have significant effect on the gross margin percentage, no cash effect and very little P&L on that bottom line effect. What percentage of your long-term core inventory would you estimate is on the full core versus the pending core sort of arrangements you're describing? I don't know the answer for that. David, do you know the answer? So, about half of our programs are on a pending core basis. Okay, so 50-50 or little over 50, I think, 60-40 basis? Okay. All right. (inaudible) Thank you. Thank you (Operator Instructions). Our next question comes from Steve Dyer of Craig-Hallum. Your line is open. Hi guys. A question, just a quick question on any revenue contribution that you can sort of quantify on the most recent two acquisitions E&M and Dixie. Is that something either in the March quarter or next year that you sort of can attribute or describe significant revenue too or material anyway? Well, I think the combined base that we bought is about $25 million plus in revenue but what we're going to do with that is, you know, I mean we have big plans for both those companies. We said that -- first, I'll talk about heavy duty. The heavy duty opportunity for us is, one, we've never really played in. I think, now we feel comfortable with both the right expertise and right structure. We've put a great -- we think we have a great program that will come of that and there's going to be a lot of revenue growth coming out of it. That's not overnight because it takes a little bit of time, obviously, the cultivating (ph) and get going. But it's definitely going to help us in terms of growth. And that's -- I mean to me, that's even -- that's over the (inaudible) what we have committed today when we talk about the optimism in that growth. And then on E&M, the emulation technology for the electric vehicle space is significant and then they're able to test inverters and electronic powertrain and the full really -- the full chassis of the -- the full complement of the electric vehicle and that emulation technology I think is leading edge and now it's technology things change quickly. But we think we've got something that's going to put us -- that will accelerate our growth pretty dramatically and so we've committed to that. We think there is a very fast evolving market that needs us. And so we think that's going to happen and then I think the other thing that's -- that we are hopeful for and certainly making great progress toward is our alternator and starter testing diagnostic business. I mean, you see some doubles already in revenue, we hope that we continue to -- that should grow exponentially over the next two years. So, and then, you look at our turbocharger line, I mean, turbocharger is evolving. We are now started to make progress there. Although the brake lines, we think of that all big opportunities to grow, we're constantly optimistic about continuing to grow rotating electrical in a very rational manner. And so, I mean it's -- we have a lot of growth prongs in play right now. All-right. Great, thanks. And then just, again as it relates to gross margin, both in the current quarter we're in and then into next year. As you know, all your commentary would suggest that -- that a lot of these things are sort of persistent whether it's wage increases or freight or different sort of things like that. But the numerical guidance would suggest a pretty quick bounce back to the top ends of some of your historical ranges. What are you sort of doing that's able to overcome all of the headwinds in a way that you kind of get back up to that 29%, 30% relatively quickly? So I'd like to say we have a magic formula but we don't. I mean, we're always watching our costs and our productivity. I think our operations team is excellent. But I think the biggest contributor to that of the return rates are really significant -- have been significant for us and then as people as adjusted their inventory and hopefully -- not hopefully, we certainly expect that those return rates will become more rational and as demand from our customers ramps up, they're going to need more product. I think, there's been some -- de-inventorization of the channels so I think there'll be more ramp up coming -- the weather, weather affects our business. So, I listen to certainly -- we are involved day-to-day in tracking our demand, but from a public perspective, you just got to listen to the reports that are coming out from the various retailers and distributors, et cetera and products and they are more, more optimistic. So as returns come down, margins go up pretty dramatically. We've had a disproportionate hit from returns. Okay, that's helpful. Last one for me. The core inventory writedown seem to be a pretty regular of them lately. Can you just sort of remind me what those are related to? Thanks. Yeah. I mean, that's a -- it's actually, that's one that I keep asking the same question, you're asking about. That is basically the value of the core inventory on the customer shelf. And so what's, what's happened is for -- we've had probably in the last two years consistent devaluation of that core and I think, that's because we -- scrap values have come down pretty dramatically I mean with the Chinese tensions with the US, and somewhat embargoes on taking scrap in. And so core values have come down, I question how much further down they can go? But we've been writing it down, again it's non-cash and it doesn't affect our contractual refundability of those cores at all. So, but there is going to be a time of day (inaudible) come back up. I mean, I just -- I don't think it's permanent and but it has been quite a long run and it's, I think probably, a longer run of deflation in core prices then we expect to do than anyone really would expect. But I think that's -- that'll reverse itself, and again it's non-cash. And so, to be clear that doesn't change, if you were to lose a penny core customer, doesn't change. You get the full amount back. Whatever the contractual buyback was, whatever you paid for the core, you get back. Thank you. I'm showing no further questions at this time, I'd like to turn the conference back over to Selwyn Joffe for any closing remarks. Great. Well, as always, I just want to thank all of our team members for their commitment and again customer-centric focus and service and for their exceptional pride in all the products we sell, and the customer services we provide. Their commitment to quality and service is also reflected in the incredible contributions they make to their communities and our society, we value our integrity, we value our core principles of the Company. I think one of the greatest assets we have is our people and the trust that our customers have in our people, and the faith in MPA to deliver projects and programs that sometimes we're not even involved in to start with. So, that continues to be our feeling in the industry and I attribute that to the incredible team of people that we have. Also I want to appreciate everybody's continued support and I thank you again for joining us for the call. We look forward to speaking with you soon when we host our fiscal 2009 (ph) fourth quarter and year end conferences call in June and hopefully we'll be at a number of conferences where we can see you. We're excited about where we are and we look forward to reporting our progress. Thank you. Thank you. Ladies and gentlemen, this does conclude today's conference. Thank you for your participation and have a wonderful day. You may all disconnect. David and Tom just revealed what they believe are the 10 best stocks for investors to buy right now... and Motorcar Parts of America wasn't one of them! That's right -- they think these 10 stocks are even better buys. 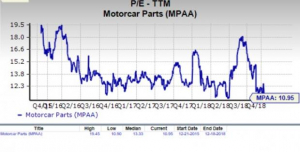 Is Motorcar Parts of America (MPAA) a Suitable Value Pick? MPAA vs. GPC: Which Stock Should Value Investors Buy Now?